To bill a purchaser for a recurring subscription, you would create a bill that has a recurring schedule. This bill would be emailed to the purchaser according to the schedule that you select. The available options via the merchant dashboard are Once (not recurring), Weekly, Monthly, and Yearly. A custom schedule can be set if using our API. The purchaser can click a link in the bill to generate a BitPay invoice from which they can make a payment. If the invoice expires before the purchaser sends the payment, a new invoice can be generated from the bill until an invoice for that bill has been paid or the due date has passed. For example, if you create a bill with a weekly schedule, the purchaser will receive a bill by email every 7 days. They can open the email and click the ‘Pay Bill Now’ button, which will show the bill and give options to add buyer information, and then select ‘Checkout Now’ to generate the invoice containing the payment information. There are two methods through which you can create recurring bills. First, you can send a bill from the merchant dashboard by going to Payment Tools > Client Billing. To set the bill to be recurring, select an option from the Schedule drop down menu and then a Delivery Date for when the billing should begin. 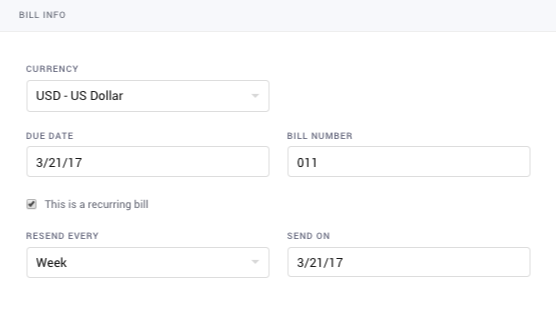 To cancel a bill, click the Cancel button to the right of the bill from your My Client Bills list. For more information on how to create a bill through the dashboard, please click the Help button at the top of the Edit Bill page.